If you are looking for a good value for money Moscow accommodation then look no further than All the World Hostel. Ideal for an overnight stop or for a long stay, this Moscow lodging has all you need to make you feel at home. Ideally situated in Moscow city center and within walking distance you will find trendy bars, friendly restaurants, great shopping and the Tulskaya underground station. Tourists who are planning on spending some time in the beautiful Russian capital city, will be really impressed by Moscow's numerous tourist and historic sites, such as the Kremlin and the Red Square, which have both been included in the UNESCO World Heritage List. A very friendly staff is on hand to provide valuable tour information and recommendations for dinner, car rental, fax service and anything else you may need. The free wireless Internet connection in all common areas and guest rooms is useful to work, to read news and e-mails and to keep in touch with friends and family. Trust your vacation to the professionals and then all the world will be opened for you! 5% discount to the owner of Hostelling International Federation card. “All The World” Hostel is located almost in historical center of Moscow surrounded by a lot of cheap restaurants, cafes, bars, various shops and attractions. 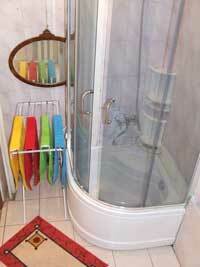 Hostel is situated just in 8 minutes walking distance from the metro station "Tulskaya".